Welcome to the Cement Americas Buyers' Guide! Claim Your Company - if your company is already listed and you'd like to make changes, follow these easy steps to update your information. Find your company listing and click on "CLAIM." Cement Americas will attach your company information to your user account and you will then have free access to edit your listing and categories. Any changes you make (ie. categories or company) must be approved by Cement Americas so please be aware there may be a timed delay in your updating. Be sure your email address matches your company name or approval time may take longer! Update Your Company - if you already have a user account and company listed, to make changes, follow these steps. Click on the first letter of your company's name and find your listing. Click on the "Edit" button where you can make changes. If the edit button does not appear, then follow the steps for claiming your company. If your company does not appear, then follow the steps for adding your company. Create A New Account - create a new account only if you do not find your company listed. Go to the MAIN category you wish to add your company listing. Click on "Add your listing here." Enter your company's information and click on submit. Your company must be approved by an administrator. Including Additional Categories - follow these directions to include your company in additional categories. Click "Edit" to edit your listing. Click on "Change Category" under the category section. Choose the sub-category you would also like your listing to appear in and then click on "Also Appear In This Category." Please limit your categories to 5. Cement Americas reserves the right to modify, approve or disapprove any listing in the Cement Americas Buyers' Guide. 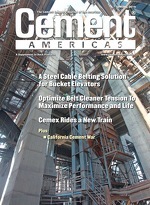 This online Buyers' Guide will also appear in the October edition of Cement Americas. Cut off for magazine inclusion is September 15. Any and all submissions after September 15 will be included the following year.